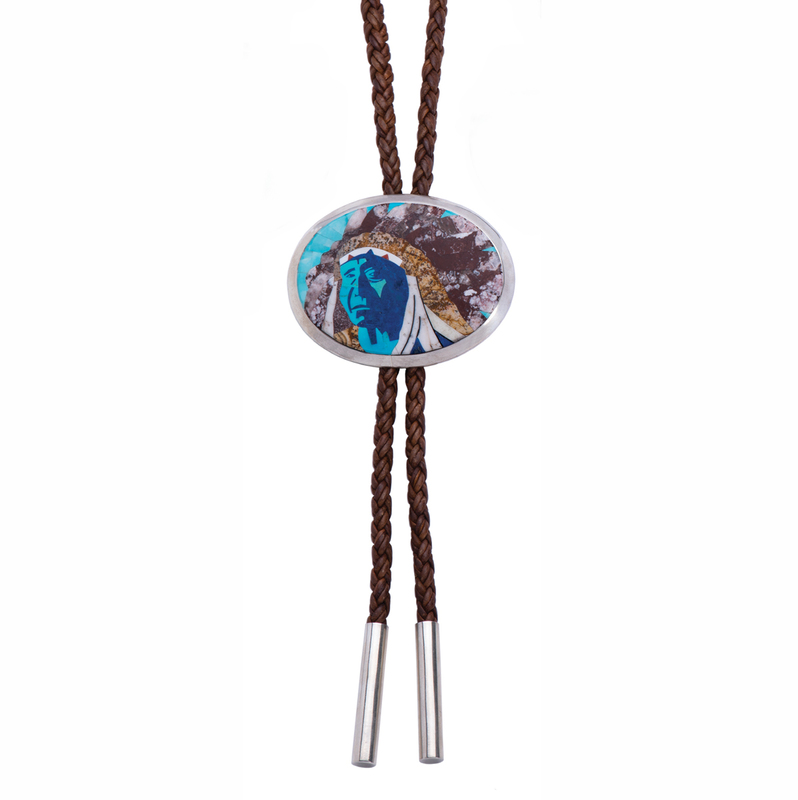 Chief Joseph Inlay Pendant handmade by Navajo artist Calvin Desson. Chief Joseph Inlay Pendant handmade by Navajo artist Calvin Desson. 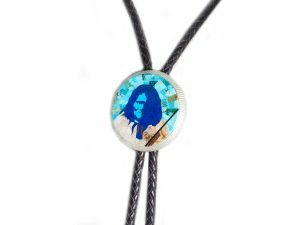 This striking pendant features hand cut lapis and turquoise set in sterling silver to depict a portraiture of Chief Joseph. The pendant measures 2 1/2″ inches around. The beads are sold separate. Navajo lapidary artist Calvin Desson is from the Lupton area on the Navajo Reservation. 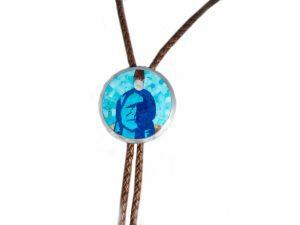 Calvin began making jewelry when he started working for the Yellowhorse Trading Post in Lupton, Arizona. He began working on his own in 2004. He is known for his patterns in inlay and micro-inlay. Calvin creates inlay scenes from what he knows: Life on the Navajo Reservation. Only the finest materials are used in his one of a kind jewelry. “I have lots of drawings. So I will take pieces from my drawings and sketch what I am going to make. The sketch will be the size of the piece so next I will make the silver. After that I get the stones I am going to use and start to cut them down, using a mini-blade. That is the process until I get the shape I want. Hin-mah-too-yah-lat-kekt (or Hinmatóowyalahtq̓it in Americanist orthography), popularly known as Chief Joseph or Young Joseph (March 3, 1840 – September 21, 1904), was a leader of the Wal-lam-wat-kain (Wallowa) band of Nez Perce, a Native American tribe of the interior Pacific Northwest region of the United States, in the latter half of the 19th century. He succeeded his father Tuekakas (Chief Joseph the Elder) in the early 1870s. Chief Joseph led his band of Nez Perce during the most tumultuous period in their history, when they were forcibly removed by the United States federal government from their ancestral lands in the Wallowa Valley of northeastern Oregon onto a significantly reduced reservation in the Idaho Territory. A series of violent encounters with white settlers in the spring of 1877 culminated in those Nez Perce who resisted removal, including Joseph’s band and an allied band of the Palouse tribe, to flee the United States in an attempt to reach political asylum alongside the Lakota people, who had sought refuge in Canada under the leadership of Sitting Bull. At least 700 men, women, and children led by Joseph and other Nez Perce chiefs were pursued by the U.S. Army under General Oliver O. Howard in a 1,170-mile (1,900 km) fighting retreat known as the Nez Perce War. The skill with which the Nez Perce fought and the manner in which they conducted themselves in the face of incredible adversity earned them widespread admiration from their military opponents and the American public, and coverage of the war in U.S. newspapers led to popular recognition of Chief Joseph and the Nez Perce. In October 1877, after months of fugitive resistance, most of the surviving remnants of Joseph’s band were cornered in northern Montana Territory, just 40 miles (64 km) from the Canadian border. Unable to fight any longer, Chief Joseph surrendered to the Army with the understanding that he and his people would be allowed to return to the reservation in western Idaho. He was instead transported between various forts and reservations on the southern Great Plains before being moved to the Colville Indian Reservation in the state of Washington, where he died in 1904. Chief Joseph’s life remains iconic of the American Indian Wars. For his passionate, principled resistance to his tribe’s forced removal, Joseph became renowned as a humanitarian and peacemaker. Still, some modern scholars argue that contemporary coverage, as well as Joseph’s own speeches and writings, may have distorted the true nature of his thoughts and given rise to a “mythical” Chief Joseph, a “Red Napoleon” that served the interests of the Anglo-American narrative of manifest destiny.